From the Star Wars collection by Funko. Star Wars Classic Mystery Minis Bobble Head Display Case. From the Star Wars collection by Funko. 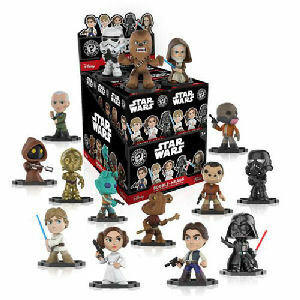 Star Wars Classic Mystery Minis Bobble Head Display Case.Case contains 12 individually blind packaged mini-figures. Han Solo - Luke Skywalker - Princess Leia - Darth Vader - Jawas - Grand Moff Tarkin and others. Measure 2.5 inches tall. Item selection is random. Items are in blind packaging. We cannot accept requests for specific items. We do not accept returns on opened items. You will receive duplicates.